You know, I was really hoping the "journalists who have never cooked before testing Rachael Ray's recipes" trend was over, but no such luck. In a self-deprecating and humorous article, Tim Madigan of the Charlotte Observer decided to try out one of the 15-minute meals from Just In Time. Instead of being negative and telling him all the places he screwed up that caused him to take 103 minutes to make a 15 minute meal, I thought I would use his article to create a list of tips that Rachael Ray often mentions (or that common dense dictate) to make cooking faster. Now, that being said, please remember that if you've never chopped an onion before and have to dig through a huge drawer of crap you never use to find your can opener, there is no possible way that you can make one of Rachael's recipes in the time allotted. Once you learn how to chop, get rid of that crap you never use, and pick up some basic cooking instincts that come with experience, the time from kitchen to table will dramatically decrease. Do not count shopping time in the time stated for the recipe. I think this is a pretty universal rule among recipe writers, but just for the record, don't do it. Rachael simply doesn't know how long it takes you to shop (if you spend 10 minutes finding produce because you've never been to the produce department, it's just not Rachael's fault). If you aren't interested in spending money of expensive ingredients like saffron, then don't pick recipes that require them. However, if you feel like a splurge, then go for it. Buy "easy peel" shrimp. The butcher has already cut the shell and removed the icky stuff, so all you have to do is simply peel the shell off. Read the whole recipe before you decide to make it. Since I watch her shows, I know Rachael's recipes always called for pre-cooked chorizo. However, if I didn't already know that, a simple skim of the recipe when I picked it out would have revealed that at no point in the recipe is the chorizo cooked. Therefore, one could infer that pre-cooked chorizo would be a better choice. They don't carry it in my store, so I use linguica. The more time you spend cooking, the easier it gets to keep the kitchen clean while you do so. You just learn to clean as you go (and a garbage bowl and other tricks help out). 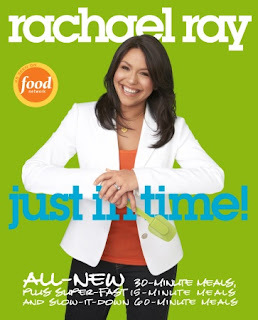 Rachael Ray is not my thing, strictly speaking. But I have to admit my own foray into the recipe world of Rachael was both rewarding and fun. The saffron and couscous put me in touch with hidden parts of my inner being. Chopping onions, cooking chorizo and browning chicken provided blessed distraction from the typical difficulties of life. When I served my wife and we sat down at the table, my first forkful tasted like something exotic and interesting and really spicy. Like paella, I guess. That day at my table, food was more than just fuel, which itself is a stunning concept. His wife even asked him to make it for her birthday. See? It was all worth it and next time it will be easier! I have never had a problem with it taking me 'longer' than Rachael to fix a 15 or 30 minute meal. I realize that she has been cooking almost all of her life and she is very organized. I have so enjoyed Rachael's recipes and I am LOVING your articles Madeline. I'm the same way, especially when I"m not in the mood to rush - they usually lake me 30-45 minutes. But that's still pretty darn fast for such great results, ya know?